Do you want to display a word file in a blog post or article? Or show a large image embedded in a small window in a blog post? Embedit web service make this process really easy and involve only few clicks. To get started upload your file or enter a specific URL. After the upload and login using your 3rd party account on Google, Yahoo, AOL, Open ID. Then, you can embed the uploaded content using quick ‘copy-paste’ embed code. It supports number of file formats including: doc, docx, xls, xlsx, ppt, pptx, pdf, wpd, odt, ods, odp. Supported image formats include: : png, jpg, gif, tiff, psd, bmp, eps, ai. 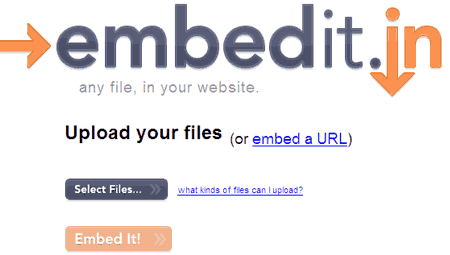 Embetit makes the process of embedding content anywhere really easy. Also, with integration with Yahoo, Google, AOL and Open ID – there is no need to create a separate account to use this service. Neat and very useful!